A slightly rounded cube of satin white glass highlights this design. An incandescent light source provides diffused illumination on both the stem and flush versions. Companion pendant and floor designs are available. 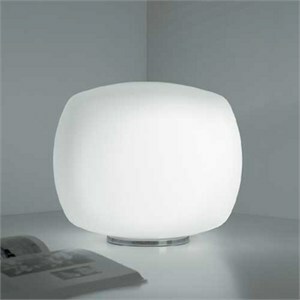 The white glass cube secures to the flush , table base or stem version with a circular turning motion and no hardware. Both versions feature a black cord and on/off switch for power. 13.75"W X 11.75"H; 6"D base.